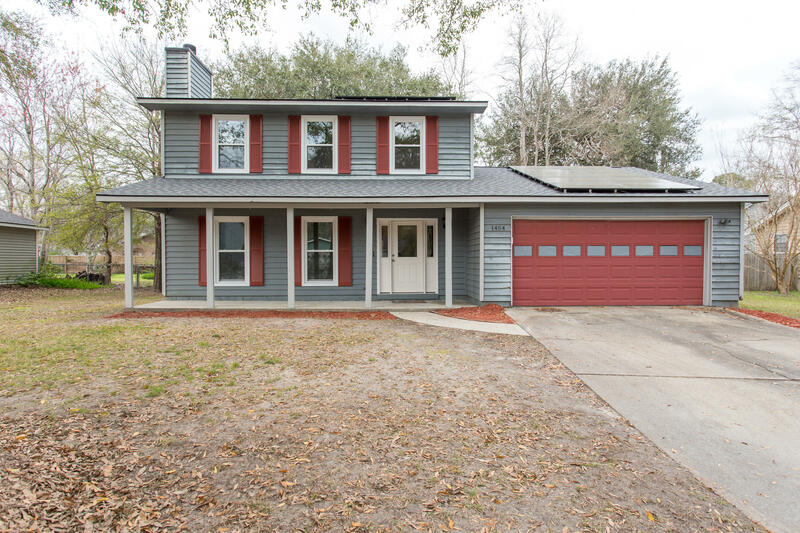 Perfectly located with easy access to 526 and hwy 17, this lovely 2-story home is situated in the back of Forest Lakes Extension off Glenn McConnell Pkwy. There have been several recent system updates including new solar ready AC/Furnace as well as windows and front door installed Dec 2018. A new roof was installed Jan 2019 and all new interior paint in Feb 2019. Solar panels have been fully paid for and keep those energy bills down. As you enter the brand new front door off the full front porch, enjoy a spacious foyer. To your left is an enormous formal living room with a gorgeous wood burning stone fireplace. A formal dining area, which opens to the fantastic back patio, is just off the eat-in kitchen consisting of new countertops installed February 2019. Additionally, the first floor includes a utility room, half-bath and a large family room / den that opens to the back yard. On the second level is the master with master bathroom, two additional nice sized bedrooms and a full bathroom. You will appreciate the attached two car garage with automatic garage door openers, plenty of parking and NO HOA. The backyard boasts beautiful mature trees that provide plenty of shade for outdoor entertaining on nearly 1/3 acre.